Patel Student Spotlight: Mateo Valdes – What Will My Gift Support? Eleven-year-old music student Mateo Valdes’ violin journey at the Patel Conservatory. Patel Conservatory violin student Mateo Valdes has a very deep and wise gaze under a flop of shaggy, dark bangs. He doesn’t make eye contact much, but when he does, he seems to possess a kind of old-soul way of knowing that belies his slight 11 years of age. 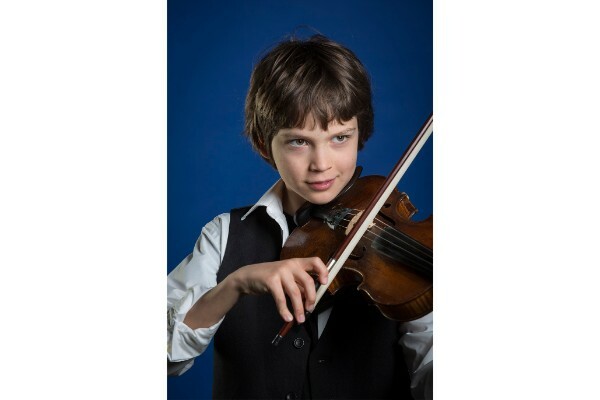 His mother, Natacha, trained in the Suzuki method as a child and continues to practice and play violin today. When her son was old enough to sit for an orchestra performance, she took Mateo to an afternoon concert. Like many people, initial exposure to the arts as a small child awakened his talent. “I saw the violin,” he says simply. “And I knew right away I wanted to learn to play.” Natacha looked for schools with Suzuki classes, found the Patel Conservatory and enrolled her son in 2013, when he was five years old. The Suzuki method involves a triangle of teaching and learning among the teacher, student and a parent or guardian. So, Natacha and Mateo began this violin journey with Dr. Catherine Michelsen, the string specialist at the Patel Conservatory. But Mateo’s “where I am now” extends beyond the next book in a serial technique. Though he continues to train and learn from his enormous support system at the Patel Conservatory and at home, Mateo’s relationship to music and to his instrument denote a young artist in the dawning of his craft. Mateo’s versatility was impressive enough to land him a spot as one of the youngest violinists in the Suncoast Super Strings, an arm of the Itzhak Perlman Music Program in Sarasota. After rehearsing with an orchestra comprised of students from around Florida, the Suncoast Super Strings performed with Itzhak Perlman himself conducting in December 2017. Mateo gets a shirt autographed by Itzhak Perlman. If you want to get involved with Patel Conservatory summer camps and classes, see what’s available and register now at patelconservatory.org. We always welcome parents and children to observe the Suzuki violin group classes and lessons! Parents can get a “pass to class” in admissions to observe our Monday afternoon group classes and private lessons throughout the week. Because the Suzuki program has a higher level of parent involvement, we want to make sure that parents and students have a thorough idea of what the program entails. There is no need for parents to have musical experience themselves. However, the triangle of student, parent and teacher is part of what makes it such a rewarding experience. We can also provide help in renting or purchasing an instrument. Love reading about all of the great things the Straz Center can do with donations from people like you? Join us! For as little as $10 you can make a difference. Go here.